Before starting my career as a full-time freelance blogger, I used to sell landing page designing gigs on Fiverr part-time. Back then, I used to make $2,000+ each month with little effort on my end, and so far I’ve made $33,640 from Fiverr. In case you’ve been living under a rock, let me explain what Fiverr is. It is the largest marketplace for selling small services starting at $5. As there are many different categories on the site, you can sell any service in which you’re really good at. With that said, Fiverr is no longer just a platform for selling gigs for pennies. Around the globe, many sellers are making a full-time income by offering their expertise on Fiverr. A note from Preston: We’re not getting paid or making any sort of money from mentioning Fiverr in this post. Enjoy. 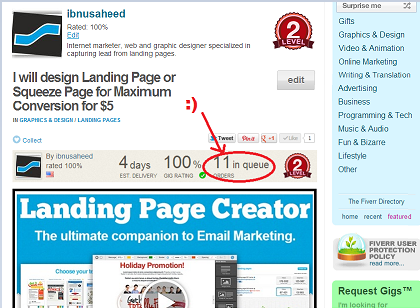 Though I am no longer selling on Fiverr, it was a great learning experience for myself as a freelancer. One of the things I hate about being a freelancer is that if you’re just getting started, most likely you’ll need to spend a significant amount of time searching for clients. With Fiverr, finding a client isn’t a hassle. All you need to do is simply create a gig and wait for orders to begin rolling in. It’s that easy! Obviously, like any other marketplaces, before creating a gig on Fiverr you’ll need to look at the competition in the category and make yours distinct from the rest. Compared to searching for clients on other freelancing/bidding sites, you’ll only need minimal effort. In fact, Fiverr is one of the easiest ways to get started with a freelancing business. In this post, I’ll explain a few business lessons I learned as a Fiverr seller and how I used it for growing my freelance business independent of Fiverr. As I said above, back when I was a Fiverr seller I used to help my clients grow their email list by creating high conversion landing pages. Aside from creating HTML landing page designs, I also offered a WordPress landing page design service using various WordPress landing page plugins. If you look at the above screenshot, you will notice that my gig was one of the most popular and I used to have several orders in the queue. Are you wondering how I was able to deliver that many orders in such a short deadline, despite being a part-time Fiverr seller? The secret is that I don’t create and sell brand new designs to each client. Rather, I repurpose existing designs and make simple changes to meet the design brief of each individual client. It’s that simple! Lesson learned: If you’re creating a product, you shouldn’t necessarily build it from the ground up. You can simply repurpose an existing product and turn it into a brand new product. For example, Darren Rowse from Problogger creates ebooks by repurposing his published blog posts and turns them to premium ebooks. Needless to say, repurposing your existing product is the fastest way to create a so-called ‘brand new’ product. When it comes to making more money from Fiverr, upselling is the secret marketing weapon. If you’re a level 1, level 2, or a super seller, Fiverr allows you to upsell your services as ‘gig extras’. In addition to the gig extra, Fiverr recently allowed sellers to offer their service as a package. This allows sellers to bundle their basic gigs with built-in revisions and extras so they can make more money. Upselling is a great way to make more profit. For example, if you provide artistic services, offer the option for your customers to purchase editable copies of your work as a ‘gig extra’. This feature allows sellers to sell their services exactly how they want to, at a price they choose. At the end of the month, if you look at the revenue you generated, you’ll notice that you made more money out of selling gig extras (upselling) than selling your primary gigs. Lesson learned: The reason why the upselling principle works is because it increases the perceived value to your clients. For your freelancing business, instead of charging a flat fee for your services, split your services into different add-ons and persuade your clients to buy them all for a higher price. If done correctly, you can make more profit by this approach rather than offering a flat fee for your service. Since Fiverr is a closed platform, it restricts its sellers to sell their services only within their platform. Unlike other service marketplaces, like Envato Studio, Fiverr doesn’t allow users to promote their website or LinkedIn profile. As a seller, you can’t share your email address or Skype ID with the gig buyers unless it is necessary for your service, and if you do so, your account will be restricted. In the case that your account gets restricted, your money flow will come to a stop. Additionally, when Fiverr updates their marketplace algorithms, chances are it will affect the visibility of your gig, resulting in a reduction of orders. If your long term plan is to grow an independent freelancing business, Fiverr might not be the right choice for you. Lesson learned: Undoubtedly, Fiverr helps you to kick start your freelancing career with ease. However, if you’re looking to build an independent freelance business, consider looking at other marketplaces like Envato Studio. Should you offer services on Fiverr? Many people used to sell gigs on Fiverr just for fun and to make some extra money in their spare time. You’ll also find that some people are making a full-time income from Fiverr. In my opinion, Fiverr is a great place to make some extra income. In fact, you don’t necessarily need to spend a lot of time on Fiverr to earn money. On the contrary, making a full-time income from Fiverr can be disastrous. Because you have no control over the Fiverr website, if they reduce the visibility of your gig, you’ll be forced to quit selling on the site. Like everything else, Fiverr has many pros and cons, but ultimately you’ll decide if it can be a benefit to you and your business. Do you have any experience in selling gigs on Fiverr? Share your thoughts with us in the comments. Shahzad Saeed is specialized in blogging and content marketing for startups and small businesses. Connect with him on Twitter or hire him for your next writing project. This was a really interesting account. I tried the Fiverr platform not for my freelance design (since it was a crime to sell those services for $5), but instead for my voice over work. I received 1 order in the 6 months I had the account active. I did everything they recommended – uploaded a professional video, thoroughly explained my services, etc. I just didn’t like the platform mainly due to what you were referencing, you can’t promote your own site and the algorithm makes it random and very difficult to get work! In addition, I honestly don’t like the platform and others like it because it devalues the work that myself and other freelance professionals put their heart and souls into. It makes it seem like everyone with a basic knowledge of photoshop or Illustrator can make a logo. Still a great article though, it’s good to examine the pros and cons of platforms like these to inform those considering it. I am shocked to read such an article on Millo encouraging Fiverr. What you guys do not realize is once your grow out of your little shells and become and adult with bills and mortgage to pay and a family to take care of, then you basically have contributed to the lack of value and respect you will get in your industry as an adult and a professional. Instead of spending this time creating your image as a professional and starting early developing relationships and a clientele that will bring you work throughout the years and value and respect your work and talent you are encouraging young designers to follow your ill advice. Hey, Sean. I totally understand where you’re coming from. That being said, we’re doing our best to explore lots of different ways creatives can make money online. Fiverr has grown from a $5-only service and now offers bundles, upgrades, and a few other cool features. I think getting worked up about how Fiverr users devalue your work is similar to getting worked up over technology that “does your job” for free or cheap. Not convinced they’re taking your business or your clients or really doing that much damage. But I could be wrong. I respect your decision on what you post on here and some good may come out of this article for junior designers, but the fact that Fiverr does not allow any contact whatsoever between the developer and the client/email,website links, etc.. Tells me that they are not looking after the interest of the designer. Valid point, Sean. I mean, they’re building a platform for you to find clients on. It doesn’t seem that evil to protect that. But even so: in today’s world, track down your client on twitter or somewhere else and get in touch with them if you really feel like you need to cut Fiverr out. You know?